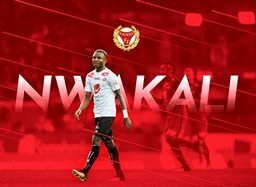 Swedish Allsvenskan side Kalmar FF have confirmed the signing of former Nigeria U20 international Chidiebere Nwakali on a four-year deal until the end of the 2022 season. The ex-Manchester City youth-teamer is joining Kalmar on a free transfer after mutually terminating his contract with Rakow Czestochowa in November 2018. Commenting on the deal, Nwakali told Kalmar's official website : ''I was recruited to Manchester City when I was 18 years old. They have been a fantastic club that meant a lot to my development. ''I had a good time there and am extremely grateful for everything they helped me with over the years. ''Meanwhile, there have been many loans where I played for Malaga, Girona, Start, Sogndal and Aberdeen. Nwakali links up with Nigeria internationals Gbenga Arokoyo and Chima Akas at Kalmar FF.